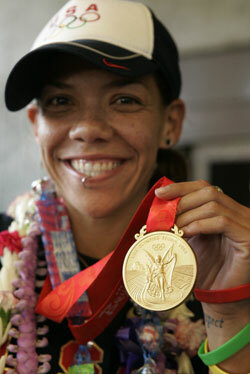 Natasha Kai, a member of the American Women's Soccer Team, showed her gold medal at Honolulu Airport yesterday as she returned home from the 2008 Olympics in Beijing. The arrival yesterday at Honolulu Airport of U.S. gold medalist Natasha Kai was almost lost amid the hubbub of other returning sports champions, namely the Waipio Little League baseball team. Even though she came in about an hour earlier on a flight from San Francisco, the tattooed Kai still cut a recognizable figure as she entered the baggage claim area dressed in her navy-colored U.S. soccer uniform and wearing around her neck, as she described it, "my bling," the Olympic gold medal. The former University of Hawaii star said she is looking forward to a two-week break with family and friends - loading up on local food and working on her tan while on the beach - before she and the rest of her teammates go on a victory tour of 10 U.S. cities starting Sept. 13. "Our first three games have already been scheduled (Philadelphia, New York and Chicago), but the last seven haven't yet so I'm hoping one game will be played out here in Hawaii," she said. "I've been on cloud nine ever since we won the gold. It hasn't sunk in yet, but I'm sure after a little downtime here at home, it'll kick in as to what our team accomplished in Beijing." The U.S. Women's Olympic Soccer Team won gold with an overtime victory over heavily favored Brazil. And it was Kai's goal in overtime against Canada in group play that got the U.S. into the medal round. "I've been dreaming about being in the Olympics since I was 5," she said. "I was also lucky to see and hang out with the women's volleyball team and (decathlete) Bryan Clay in the athletes' village, and we would throw a shaka sign here and there to each other. And later, after we won our medals, I would catch that look in their eyes, knowing how proud we were of each other." After the victory tour, Kai, already with an agent, will take her skills to the Women's Professional Soccer league, scheduled to launch next spring.